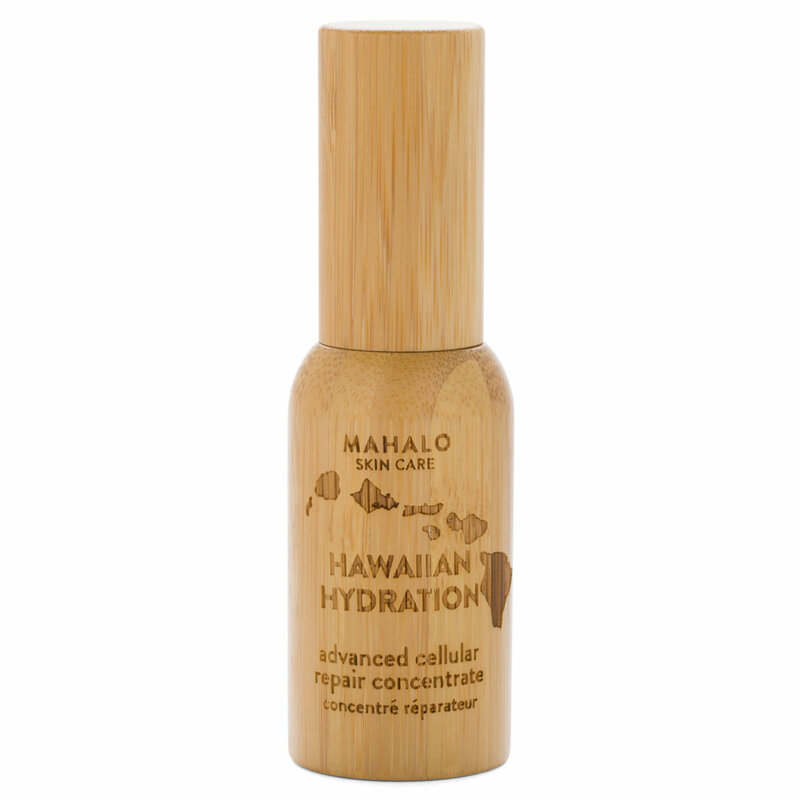 Formulated with troubled and compromised skin in mind, The HAWAIIAN HYDRATION Advanced Cellular Repair Concentrate glides onto skin to deliver collagen-boosting nourishment, protection from free radicals, and soothing hydration. Crafted from aromatic botanical extracts, this oil-free multitasker helps to repair the damage at the root of many skin issues, such as flakiness, acne, redness, discoloration, and visible signs of aging. Massage 1-3 pumps into clean skin in the morning and/or at night. Because The HAWAIIAN HYDRATION helps other products absorb better, it should be your first step after cleansing. For an extra boost of moisture, create your own hydrating emulsion by combining 1 pump of concentrate with 1 pump of The VITALITY ELIXIR Facial Serum. Bummed out that this broke me out all over my face. Not the biggest surprise since I have acne prone, sensitive skin but I have to disagree with the product description: "It is especially beneficial (...) those prone to acne." However, let me tell you about the positives: it did hydrate my skin very nicely (but I've had a better one that was more expensive, about + 60 $). The "wood bottle" is very nice, the pump is high quality and the product absorbed rather quickly but the texture... let's go to the cons. What I didn't enjoy is the texture of this product. Hard to describe but what was annoying is that when I wasn't careful and not working the product in my palm (kinda smoothing out the texture, warming it up) before putting it onto my skin (when tired, rushed etc. ), I had little brown thick pieces of it on my skin. Easy to remove but still a negative imho. Neither negative nor positive was the smell: no perfume, just the product itself has a noticable scent (that faded away). Referring to the product description: I saw no firming, smoothing (haha), improvment of my discoloration but I will not judge this too hard because I stopped using the product after a rather short time, about three to four weeks. Overall the positives were good but not overwhelming. The breakouts are an absolute no-go for me. It's a nice product but I wouldn't say it's a must-have. omg im sooooo sad! ive waited for it to go out when they first anaunce it- but---- it is not for me at all ! i have very dry skin, it is hydrating, but it broke me out after the 3rd time ive tried it. im so dissaponted! the smell is not great but not bad and dissapears after you put it on, but if you are prone to breakouts- skip on it!